The Ten Commandments: Why ten? Numbers are used all through out the Bible to denote exactness and sometimes approximation. The number of brethren who saw the risen Christ was more than 500! The number 500 in this verse shows approximately the more than sufficient number of witnesses of the resurrection of Christ. Most of the time, numbers are used to denote exactness. The number eight (8) in the preceding verse gives the exact figure of humans who boarded the ark. God is the only one person in the universe who knows exactly the exact number of everything that exists! He is the only power that can make one hair black or white! Bald billionaires may testify to this truth. Not even their billions can bring back their beautiful hair. God even counts hair to assure protection! Even the innumerable stars are numbered and named by God Almighty! You might ask me why the Bible did not record the number of stars. There was no numerical figure during those times when the Bible was being written (and even now that we have the Hubble Space Telescope) to sufficiently and exactly give us the number of stars in the universe. Stars are innumerable by human standards. The term googol was very recently applied by modern mathematicians. This is another proof that the Bible is an authentic, scientific book! PARIS (AFP) – Astronomers may have underestimated the tally of galaxies in some parts of the Universe by as much as 90 percent, according to a study reported on Wednesday in Nature, the weeklyBritish science journal. Surveys of the cosmos are based on a signature of ultraviolet light that turns out to be a poor indicator of what’s out there, its authors say. In the case of very distant, old galaxies, the telltale light may not reach Earth as it is blocked by interstellar clouds of dust and gas — and, as a result, these galaxies are missed by the map-makers. “Astronomers always knew they were missing some fraction of the galaxies… but for the first time we now have a measurement. The number of missed galaxies is substantial,” said Matthew Hayes of the University of Geneva’s observatory, who led the investigation. Hayes’ team used the world’s most advanced optical instrument — Europe’s Very Large Telescope (VLT) in Chile, which has four 8.2-metre (26.65-feet) behemoths — to carry out the experiment. Ten, denotes exactness of the commandments that were written on two tablets of stones. Why is it necessary to put the number ten? Because some unscrupulous writers may add to the commandments which is against God’s will! Even a jot or a tittle must not be taken away from the complete commandments. Adding anything is also against God’s exact will. To know how to count is a very important wisdom in the Bible. While they insist that there are Ten Commandments, they baptize their members! Baptism is a commandment of Christ. It is not written nor included in the two tablets of stone. There were only ten commandments written on the stone which God gave to Moses. A simple knowledge in arithmetic can disprove the claim of the Seventh Day Adventist Church that the commandments that apply to all humanity at all times are the Ten Commandments. Granting that the Ten Commandments are now in force, plus baptism, there will be no ten but eleven commandments! The truth and the fact is: the giving and the collection of tithes is another commandment. You will not be speaking the exact truth if you say that there are ten commandments, and at the same time you are baptizing and collecting tithes! It will not be very easy for the leaders of the SDA to do away with the tithes, because it is through the collection of tithes that they enrich themselves. There was a change of priesthood. The Levitical priesthood ended in Christ so with the law on tithing! The law on giving in the Christian era is not tithing! Why are these people (SDA) misled? It is because of the erroneous teachings that came from an unauthorized teacher. Let the woman learn in silence with all subjection. But I suffer not a woman to teach, nor to usurp authority over the man, but to be in silence. For Adam was first formed, then Eve. Women leaders are prophesied to mislead people! 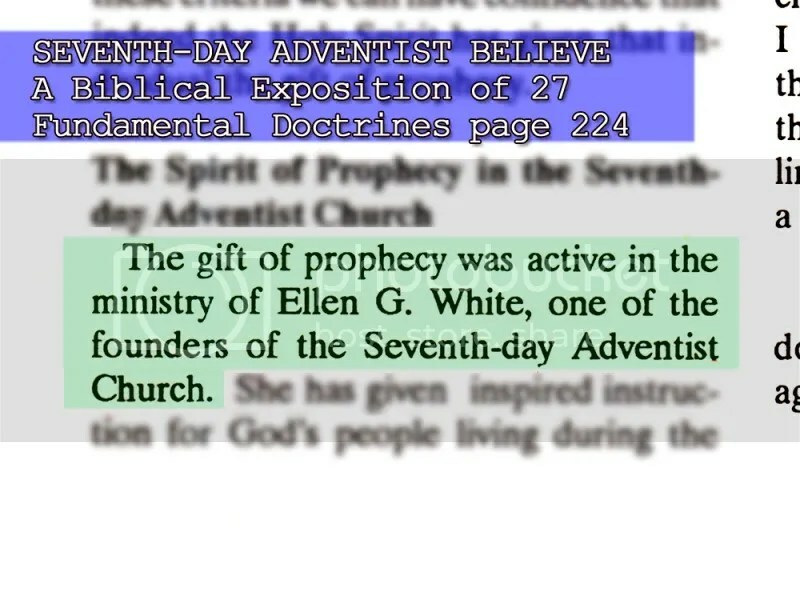 Ellen G. White is a self-proclaimed teacher who founded a false church which is now called the Seventh Day Adventist Church! The Ten Commandments ended in Christ. Its efficacy was until John. The law and the prophets were in effect until John came; since then the good news of the kingdom of God is proclaimed, and everyone tries to enter it by force. Jesus preached the Good News or the Gospel, not the Ten Commandments! Christ repealed the Ten Commandments! Hating a brother in Christ is a serious offense in the commandments of Christ! The law of Christ is the law for Christians. Paul counted himself as under the law of Christ and not under the Ten Commandments. 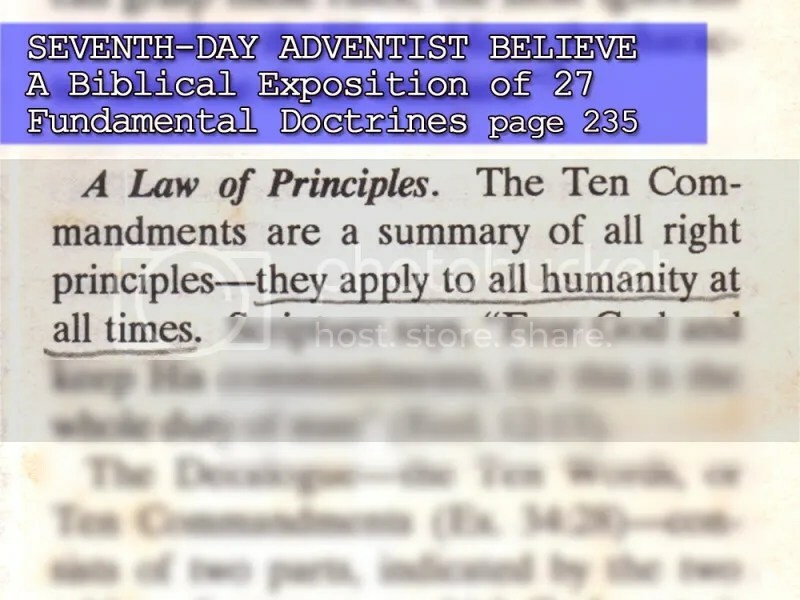 A little understanding of mathematics and logic will enlighten the members of the Seventh Day Adventist Church who were misled by Ellen G. White! You know that Noah’s Flood story derives from the Epic of Gilgamesh. Come on bro. Eli, Noah’s flood story is just a Myth. Don’t put it here. You’ll be in great trouble. Christ is just a cosmic being and he is NOT A HISTORICAL FIGURE. Paul invented Christianity between 40-70 AD. We all know that Paul came from Tarsius of Cilicia where MITHRAISM is rampant! Mithraism has parallels with JC! The book of Matthew was written ~80AD or near before after the destruction of Jerusalem. During the first century, the life expectancy of the people is 35. If Matthew is an EYE WITNESS how come he wrote the story 50 years after? A VERY OLD GUY?? NON SENSE! JC and CHRISTIANITYY is just an invention of DIASPORA JEWS! and another faction is just an invention of Paul! If you’re in truth, you will approve this comment. Bro. Eli has written several articles on his blog regarding your claims. Let me provide you and the other reader with the links. Please don’t presume that Bro. Eli Soriano will get into trouble. You just don’t know how gifted he is when it comes to biblical teachings. He can prove that the Bible is scientific to anyone in a debate. Do you want to prove that? For the rest of your comment, please don’t give us that attitude as if all your claims are generally proven facts and/or a common knowledge and irrefutable. Also, please don’t pretend to be an expert on things you’ve probably just read somewhere on the internet by some guys who just got it from their speculative heads even without solid proofs. And how accurate are you Luis? What calendar are you basing proving that the book of Matthew was indeed written @ A.D.80? What presumption are you talking about? what life expectance? Today’s life expectancy is 60 for males and 69 for females but because human beings aren’t able to decide when to die, of course, some powers above may prolong or shorten their lives. And because you’re atheist, just wait for the judgment. Justice will prevail there: you don’t acknowledge that someone caused your existence;then He will also deny your existence. engage in a live debate with Bro. Eli and many will bear witness to your foolishness. DARE??? Debate with Bro Eli and you’ll redefine the word intellect! Thanks be to God for sending Bro.Eli,a true mathematician who used the very reliable source the Bible.We’re looking for more God’s wisdom tru You and bro.Daniel.May God bless you always po. SDA is less than nothing. The exactness of the words of God in the Bible is truly astounding! And the information it gives about number concepts are just mindboggling. And when all these finite has come to end, we’ll all definitely know infinity which is endless and everlasting. DANIEL 12:2 — And many of them that sleep in the dust of the earth shall awake, some to everlasting life, and some to shame and everlasting contempt. Of course, we have no way of knowing all these truths in the Bible without God’s sent preacher of our time, Bro. Eli Soriano. another article of wisdom from the sensible preacher of this dispensation, hope SDA members and other religious denomination will understand that commandments in our dispensation is not only ten. and the change of priesthood from Moses to Jesus Christ…if your pastors are keeping on collecting tithes but not keeping Christ’s commandments, its time to leave your group. It is really amazing to know all the numbers written in the bible and compare and explain it! Thanks be unto God for giving this kind of wisdom to Bro. Eli! Yeah, in mathematical equations if your answer is not exact, definitely it is wrong. What more should it be if it is about the Word of God. I agree that we should not add or subtract anything on what the bible says, specifically on the Words or Commandments of God. Who is man that tries to be more intelligent than God?Who is man that wants to add his/her own ideas on God’s thoughts? People should be careful in using God’s words because humans have no right to add anything on what is written, because in the first place man’s knowledge is from God. People should be careful because the Bible is not an ordinary book. It is very superficial to believe that the Genesis flood account was derived from the Epic of Gilgamesh. There are great differences between these two especially in the timing of each of the flood accounts and the nature of the vessels. Also, available data to accuse that Noah’s flood story was a copy of Gilgamesh doesn’t fit. Examining the Epic of Gilgamesh, it renders a very mythological story that is far from reality, therefore, considered it as a myth. But in the Genesis flood account, the story has a historical, logical and scientific manner that contributes for its being real. But granting those two accounts have similarities – “similarities that would be expected to be found in any ancient flood accounts”- believing that the Genesis story was derived from the Epic is a non sequitur. Following your case, there are paleontologists who assert that man came from ape because of their similarities. But I bet you will not agree that you are an offspring of apes because you have similarities with them. And you will not either agree that you have the same thinking as theirs. Better study carefully and understand what Bro. Eli Soriano is preaching. Anyway, nobody will subscribe to such baseless and superstitious accusations. This is another classic deception worth recording among the world’s greatest lies! As stated above, it is as if Christ and God the Father are against each other. How tragic an analysis and conclusion from a man claiming to be a Christian, a man of God and a man of the Book! Do the laws/commandments of God and of Christ contradict each other? The arguments presented are too elementary. Take for example the Ten Commandments and the laws on tithing and baptism. Just because tithing and baptism were not literally written in the Ten Commandments, does it follow that Christians are not to obey such practices? The Ten Commandments stand immovable and unchanged from the time they were given by God to the time of Christ, to the present, until Christ’s second coming, and even in the new heaven and earth. It is ironic and even revolting to the senses to cite all the right passages in the Bible only to reach a very wrong conclusion! To declare that “Christ repealed the Ten Commandments” is ridiculous! The Bible is replete with passages evidencing Christ’s upholding the commandments of his father even the Ten Commandments. Why are some people so against the Ten Commandments of God as written in the two tablets of stone? Why do some people insist in proclaiming that the Ten Commandments of God are no longer in effect today? I earnestly plead on every human being to take a very careful scrutiny of God’s commandments in relation to Christ’s life and teachings. I can assure you this early that neither in Christ’s earthly life, nor in all ages to come did Jesus ever intend to “repeal” the Ten Commandments of his father. The 10 commandments were specifically given to the Israelites in Moses’ time. The law and the prophets were until John the Baptist, and since then the good news of the kingdom of God is preached. But when Jesus Christ came with a new covenant, He has made the first obsolete. Now what is becoming obsolete and growing old is ready to vanish away. And by Jesus Christ everyone who believes is justified from all things from which you could not be justified by the law of Moses. The law which every Christians are obeying is no more written with ink nor tablets of stone but with the Spirit of the living God on human hearts. 2 CORINTHIANS 3:3 — And you show that you are a letter from Christ delivered by us, written not with ink but with the Spirit of the living God, not on tablets of stone but on tablets of human hearts. There’s no logic for Jesus to preach the Law of Moises,specifically the 10 commandments. Remember, Jesus came into the nation of Israel who was keeping the sabbath and other commandments of Moises. Luke 16:16, Matt. 23:23. The very reason why Jews didn’t accept him was because of this,He change the law from 10 commandments to a broader set of laws. The safest and clearest conclusion is, Jesus came here to introduce a new way to follow God. Had not he been broke the sabbath,he wouldn’t have done or said anything against it! Christ had never broken any of the ten commandments. If Christ did, then He would have sinned and couldn’t have been a perfect sacrifice. I John 3:4 – Whosoever committeth sin transgresseth also the law: for sin is the transgression of the law. But we know that Christ lived a perfect life and became our example to follow. Mat 12:8 – For the Son of man is Lord even of the sabbath day. Mar 2:28 – Therefore the Son of man is Lord also of the sabbath. And this is the seventh-day Sabbath because Christ was talking with the Jews. Christ did also preach to keep all the commandments and said that it will ALWAYS stand. Mat 5:17 – Think not that I am come to destroy the law, or the prophets: I am not come to destroy, but to fulfil. Mat 5:18 – For verily I say unto you, Till heaven and earth pass, one jot or one tittle shall in no wise pass from the law, till all be fulfilled. Mat 5:19 – Whosoever therefore shall break one of these least commandments, and shall teach men so, he shall be called the least in the kingdom of heaven: but whosoever shall do and teach them, the same shall be called great in the kingdom of heaven. to those people who leave stupid comments pls read this. -there’s no wrong information about this blog. I think every words came from bro.Eli is 100 percent written on the scriptures. If you think youre a wise than bro. Eli test your self and your faith with him and im very sure you lose !!! the battle againts the truth. is the only source of truth. I challenge all religion leaders to face Brother Eli in the debate. Those who preach that the Ten Commandments of God are no longer binding to this day are teaching people lawlessness, defiance and outright rebellion to the authority and sovereignty of God. Those people, more than anyone else, are to be held responsible for the widespread idolatry, immorality and criminality that pervade the society. Rather than drawing men to obedience and loyalty to God’s moral standard, they, by their distorted teachings, in effect, create in men a spirit of monstrosity. They preach to men the very same spirit of rebellion that made Lucifer a traitor! @Espogi4 – Please don’t accuse Christ and God of the things you don’t understand! It’s not you who gives the law nor that any of your rants has the power to reverse the truth. The Law of Moses is for the Israelites in his time. The Law of Christ is for Christians from the time of the apostles up to our time. Have you even read your Bible in its entirety to act as if you know everything? So don’t be ridiculous and stubborn! ACTS 13:39 — and by Him everyone who believes is justified from all things from which you could not be justified by the law of Moses. HEBREWS 8:13 — In that He says, “A new covenant,” He has made the first obsolete. Now what is becoming obsolete and growing old is ready to vanish away. What’s been made obsolete is obsolete! Don’t be a hypocrite as if you’ve been obeying strictly the 10 commandments and all the laws in the old testament. Calm down.No need to be agitated and throw unfounded accusation. 2 a : on the contrary : on the other hand : notwithstanding —used to connect coordinate elements b : yet c : with the exception of —used before a word often taken to be the subject of a clause http://www.merriam.com. So far, no SDA apologist has ever come out with a concrete explanation on this specific issue. Bro.Eli’s teachings are all based on Jesus’ pronouncements and doctrines! There is a big difference between the 10 commandments and the commandments of Jesus! And the deeper essence of Jesus’ commandments prevent any person from committing adultery for instance. The law of Christ eliminates the possible root of adultery and all other commandments in the deca law and that makes the law of Christ broader and different from Moises’. very enlightening.. it’s pleasing to know that even numbers make sense in the Bible. Thanks God for this wisdom taught through Bro. Eli! SDA pastors did not understand simple logic and mathematics… Why? the reason is written in 2 Corinthians 4:4 – satan, the god of this world, blinded their minds. May the Peace and Blessings of the Lord be always with you Bro Eli, Bro Daniel, KNPs, TPs, workers, brethrens in the Church of God, and fellow bloggers. It is always enlighthening to be a part of any and all of Bro Eli’s discussion. Mathematics, Logic, and many other subjects are part of God’s many gift to man. While we are still in this world, no amount of human wisdom nor understanding can measure to even a very miniscule part of God’s wisdom. This is a reality that Bro Eli has biblically proven, and that no man can contest. mentioned the biblical proofs already, yet many, like luis media, esporgi, and their likes seem not to understand. We will just go on praying that God will someday open up your hearts and minds to God’s truth. There is no point citing to you the many more verses that Bro Eli’s information are from the Lord God. We will request you to be in this blog always; you might find the TRUTH and your SALVATION, luis media, esporgi, and other non-believers. Please go on with your burdensome evangelical crusade Bro Eli and Bro Daniel, we will always support you and pray for you. Hey, now it’s clearer. That’ why you think differently because you do not believe at all in the God of the Bible. I’m impressed, you read much. But pardon me, seems you do not understand everything you read. Your have a strong bias towards Christianity. Again, my friend just try to be open minded. Be more reasonable. Avoid being judgemental. A friendly question? So what do you believe in? Are you an atheist? You might ask me why the Bible did not record the number of stars. (…) This is another proof that the Bible is an authentic, scientific book! What..? I don’t get it… What proof? in the debate?hoo!Bring your pastors. Are you Man enough to Face Bro. Eli for a Man t0 Man discussion of Faith? huh? Give us your Standing point…. 3.Paul invented Christianity between 40-70 AD. We all know that Paul came from Tarsius of Cilicia where MITHRAISM is rampant! 4. The book of Matthew was written ~80AD or near before after the destruction of Jerusalem. During the first century, the life expectancy of the people is 35. Now lets see, who’s old and NONSENSE. IF YOU WANT TRUTH, YOU MUST FACE BRO. ELI FOR A DISCUSSION. otherwise you’re just another moron bites the dust.